Ray Taliaferro, an outspoken liberal who from 1977 through 2011 hosted an overnight talk radio program on KGO, has been found dead. Taliaferro had been missing for three weeks. His son tells ABC7 there’s been no luck getting in contact with his late father’s wife. 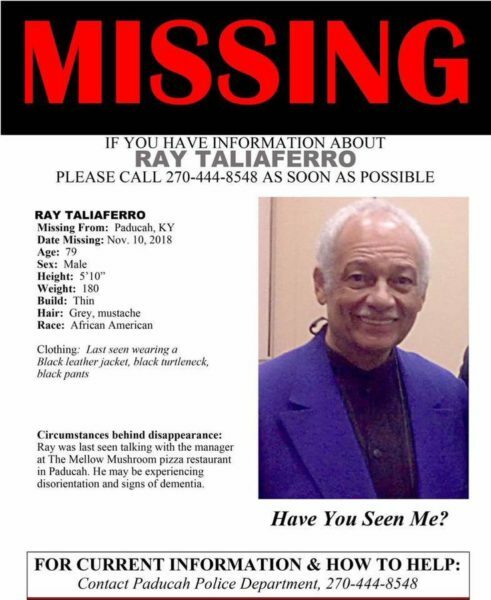 Taliaferro, 79, was reported missing Nov. 10, according to the Massac County Sheriff’s Department, based in Metropolis, Ill., across the Ohio River from Paducah. Further details surrounding Taliaferro’s death are not clear at this time. Taliaferro has a long professional resume, which includes leading the San Francisco chapter of the NAACP. He also is credited as being the first Black talk-show host in a major market radio station (New York City) and being named San Francisco’s first Black member of the Arts Commission. Anyone with info about his death or disappearance is asked to contact the Massac County Sheriff’s Department at 618-524-2912 or the Paducah Police Department at 270-444-8550. I spoke much about Ray in an earlier posting on this forum so I won’t add much more except even though as a flaming liberal Ray did drive me crazy at times, he did contribute to my slipping for a long while into a blue piled world. It was odd at how he could make me mad as a listener and still colour my mind as to having a liberal POV and unknowingly virtue signal for many years of my life. But Ray was entertaining, you gotta give that to him. Listening to Ray for me from 1983 to 2011 makes me feel as if I knew him, sort of like a crazy uncle 🙂 So reading of his passing here is sad. I hope he did not suffer in his last hours. RIP Mr Taliaferro… An RCA 44-BX Velocity Ribbon Microphone and a nice padded radio broadcaster’s chair awaits for you in your afterlife, your radio broadcasting time slot is as per usual 1:00am till 5:00am. Your radio call letters are KJO810AM News Talk.